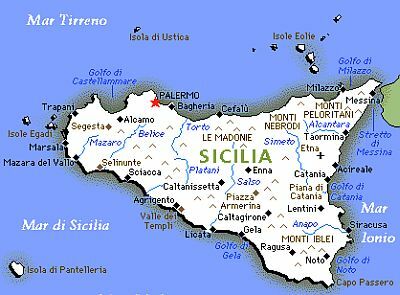 In Sicily, the largest island in Italy and the Mediterranean with its 25,711 square kilometers (9,927 square miles), the climate is Mediterranean along the coasts and on the smaller islands, with mild, moderately rainy winters and hot, sunny summers. In inland areas, the climate is slightly continental at an altitude higher than sea level, where winters become moderately cold and summers are still hot (and often scorching), while in mountain areas it is colder, although at the same altitude it's certainly not as cold as in the Alps or the Apennines. The highest mountain is Etna volcano, 3,329 meters (10,921 feet) high and located in the eastern part of the island. The top, which is located just 25 km (15 mi) away from Catania, in winter (and often also in spring and autumn) is covered with snow. Almost the whole interior of Sicily is occupied by hills and mountains; in particular, in the north we find some mountain ranges parallel to the coast: the Madonie, whose highest peak is Pizzo Carbonara, 1,979 meters (6,493 feet) high, the Nebrodi, whose highest peak is Mount Soro, 1,847 meters (6,060 feet), and the Peloritani, which reach 1,374 meters (4,419 ft). In the center and south of the region, there are mostly hills and low mountains, reaching about 1,000 meters (3,300 feet) above sea level, with the exception of the Sicani Mountains, about 30 km (18 mi) south of Palermo, which reach 1,613 meters (5,292 ft) in the highest peak, Rocca Busambra. Above 1,000 meters (3,300 feet), rainfall is more abundant than at lower altitudes, so as to allow forests to grow. On the contrary, precipitation is usually not abundant at low altitudes, since they range from 400 to 600 millimeters (16 to 23.5 inches) per year: it amounts to 495 mm (19.5 in) per year in Trapani, 525 mm (20.5 in) in Syracuse, 545 mm (21.5 in) in Catania, 555 mm (22 in) in Enna, 610 mm (24 in) in Palermo, and just 370 mm (14.5 in) in Gela, on the southern coast. Messina is an exception, with 850 mm (33.5 in) per year. The rain pattern in Sicily is Mediterranean, with a maximum in autumn and winter, when thunderstorms are fairly frequent as well, a drop in spring, when there is already little rain, and a minimum in summer, when it rains very rarely. The landscape is often semi-arid, also because of the long summer drought, especially at low altitudes and on the southern slopes. The island is subject to the sirocco, the hot wind from Africa, which can raise the temperature to around or above 20 °C (68 °F) in winter and 40 °C (104 °F) in summer. During the days with the most intense sirocco, the temperature reached as high as 43 °C (109 °F) in Messina, and 44/45 °C (111/113 °F) in Trapani, Palermo and Catania. Another frequent wind is the fresh mistral, blowing from the northwest and affecting mainly the western part of the island. Winter cold spells, which come from the Balkan Peninsula, usually do not last long in Sicily, two or three days, and typically are not intense along the coasts, where cold records are around 0 °C (32 °F), and snowfalls are very rare (occasionally it can snow in Palermo and Messina, on the north coast, while on the south coast in practice it never snows). In the hills of the interior, however, snow is a little more frequent, while in mountainous areas above a thousand meters (3,300 feet), it can sometimes be abundant. An exceptional snowfall occurred on December 31, 2014, when snow occurred in areas where it is almost never seen, as in Cozzo Spadaro and Pachino, on the southeastern tip of the island. Now let's see the data of some cities, starting from the coasts. 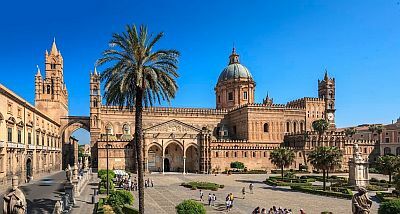 Palermo, the region's capital, overlooking the Southern Tyrrhenian Sea, like the rest of the Sicilian coasts has very mild winters and hot summers. The city is prone to the scirocco, which is able to increase the temperature by several degrees, but also to the maestrale, the wind that comes from Sardinia. During the summer, when sunny days prevail, the sea breeze tempers the heat. Rainfall amounts to 615 millimeters (24 in) per year, with a maximum in autumn and winter and a minimum in summer, when it almost never rains. Here is the average precipitation. The amount of sunshine in Palermo, and in general in Sicily, is great in summer, when clear skies prevail; in winter, sunny periods alternate with periods of bad weather, with rain, wind and thunderstorms. 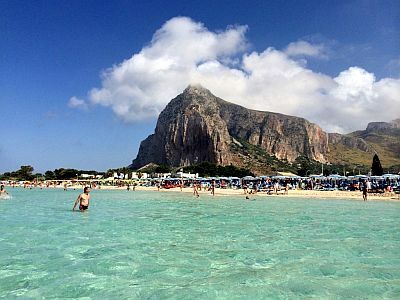 The north-western coastal towns that are located in more exposed areas, from Mondello to Isola delle Femmine, and from Terrasini to San Vito lo Capo, are in summer a bit cooler and windier, in fact the maximum temperatures in July and August are about 28/29 °C (82/84 °F) on average. In Trapani, and in other locations on the west coast (see Marsala, Mazara del Vallo) as well as in the rest of the north noast (see Cefalu, Milazzo), the climate is similar to that of Palermo. On the north-eastern tip of Sicily, we find Messina, which has a particularly warm microclimate because it is closed between the strait of the same name and the Peloritani Mountains. You can notice in particular the high minimum temperatures. For its location, Messina is also particularly rainy compared to other coastal and low-lying areas of Sicily: precipitation amounts to 850 mm (33.5 in) per year, with 100 mm (4 in) per month or more from October to February. However, even here in summer it rains very rarely. Taormina is on the east coast, halfway between Messina and Catania, 200 meters (650 feet) above sea level, at the foot of a hill of 400 meters (1,300 feet), with panoramic views on the sea, and Mount Etna in the background. Around 3 km (2 mi) south of Taormina we find Giardini-Naxos. On the east coast of Sicily, we find Catania, which is located in the plain of the same name, the only plain of some importance of the region. Here the temperature range is slightly higher, in fact nights are a bit colder in winter, while in summer this is one of the hottest areas in Italy. 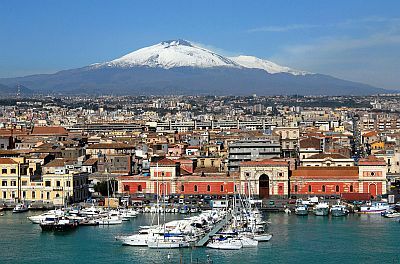 While in Catania, which lies on the coast, the average maximum temperature in July and August is 32 °C (90 °F), in Sigonella, 15 km (9 mi) from the coast, it reaches 33 °C (91 °F), and in Lentini 34 °C (93 °F). The highest records are remarkable as well: at the Fontanarossa airport the temperature reached 45 °C (113 °F) in June 1982, and 46 °C (115 °F) in July 1962, while in Catenanuova, about 40 kilometers (25 miles) away from the coast and in the province of Enna, it even reached 48 °C (118.5 °F), though not in an officially recognized weather station. Here are the average temperatures in Catania. In Catania, 550 mm (21.5 in) of rain fall per year, with a maximum in autumn, and as usual, a pronounced minimum in summer. Here is the average rainfall. Further south of Catania, and still on the east coast, we find Syracuse, where the climate is similar, although the night temperatures are slightly higher. In Syracuse, precipitation too is similar in both amount and pattern to that of Catania. On the south coast of Sicily, in cities such as Sciacca, Porto Empedocle (near Agrigento), Licata and Gela, the climate is similar to that of Syracuse, although the rains are even less abundant, in fact they hover around 400/450 mm (15.5/17.5 in) per year, and in some cases they drop even below 400 mm (16 in). The sea in Sicily is warm enough for swimming from July to September. In June, the sea is still a bit cool, while in October, after the summer, the water temperature is still decent, around 23 °C (73 °F): on fine days, perhaps with the sirocco, locals go to the beach. For example, here is the sea temperature near Palermo (in the rest of the region it's essentially the same). With the exception of the already mentioned plain of Catania, the interior of Sicily is occupied by hills and mountains. Here, winter gradually becomes colder with increasing altitude, and above 800 meters (2,600 feet), and sometimes as low as 500 meters (1,600 feet), during cold spells it can snow; sometimes fog can form. In summer, however, a peculiar situation occurs: in the first few hundred meters of altitude, the temperature does not decrease, actually it can be even higher than on the coasts, since the mild influence of the sea here is absent or reduced, so there are often very hot days. Precipitation in this area is generally quite low, around or below 500 mm (20 in) per year, while it increases again at higher altitudes, above 1,000 meters (3,300 feet). As always, however, summer is the driest season. For example, here are the average temperatures of Ragusa, the capital of the southernmost province of Italy, located at 500 meters (1,600 feet) above sea level. In Caltanissetta, at 570 meters (1,870 feet) above sea level, the temperatures are very similar to those of Ragusa. To find lower temperatures also in summer, we have to climb further in altitude. 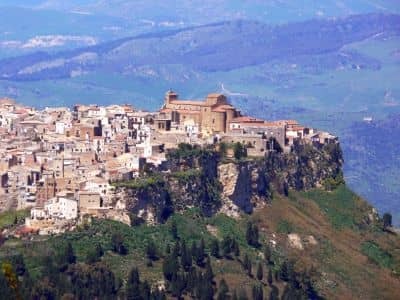 In Enna, the highest provincial capital of Italy, located in the center of Sicily and at about 900 meters (3,000 feet) of altitude, fog often forms in autumn and winter, while in summer the heat is generally bearable, althoug with the sirocco, the temperature can reach 35/36 °C (95/97 °F). In winter, during cold spells, sometimes it can snow and freeze. Here are the average temperatures of Prizzi, located further to the west, at 1,000 meters (3,300 feet) above sea level (and whose temperatures are similar to those of Enna). In Prizzi, 600 mm (23.5 in) of rain fall per year, as always with a maximum in autumn and winter and a minimum in summer. The best time to visit Sicily for a beach holiday is the summer, from June to August. The sea temperature is comfortable enough from July to September, although in September, which in any case is still a good month (especially in the first half), the first periods of bad weather begin to occur. In June, as mentioned, the sea is still a bit cool, while in May it's even cold, and sometimes the air can also be a little cool for sunbathing. April and May are advisable for hiking and visiting cities, while in summer it can sometimes be too hot to get around with ease. In October, the temperatures are mild or pleasantly warm, but the days are shorter and the weather can be rainy and windy.